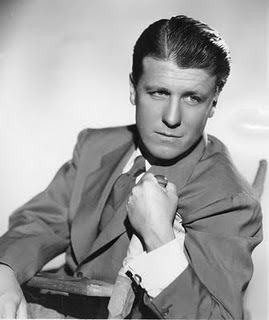 In 1948, Irene Dunne was a very youthful looking 50-year-old actress. When she made I Remember Mama, Dunne was fitted with padding to make her appear overweight and makeup was applied to make her look older. It’s hard to believe that Dunne wasn’t the first choice for Marta Hanson because her performance as the matriarch of a clan of Norwegian Americans is one of the great screen characterizations of all time. Before Dunne signed on to the project, the property had been bought with hopes of coaxing Greta Garbo out of retirement. Garbo had also turned down Alfred Hickcock around the same time she was being considered for I Remember Mama. Hickcock wanted Garbo to play a murderess in The Paradine Case (1948). She supposedly said “No murderesses, no mamas” and remained in retirement. Marlene Dietrich expressed interest in the role, but producers didn’t think she had enough warmth to portray the character effectively. When Dunne was onboard, everything fell into place. 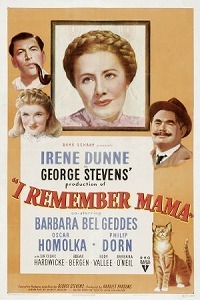 I Remember Mama was director George Stevens’s first major production since The More The Merrier (1943). Having served overseas during World War II, observing and filming the liberation of several Nazi death camps, Stevens wanted to return to a simpler time. Stevens was one of the top directors of his day. He directed Gunga Din (1939), Penny Serenade (1941), and Woman of the Year (1942). For this, her last great screen role, Dunne received her fifth Academy Award nomination for Best Actress. The film was nominated for four more awards, but was shut out in every category.The Best Actress race of 1949 was a competitive one. 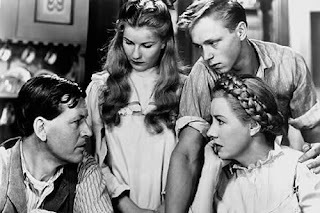 The other actresses in the running included Ingrid Bergman in Joan of Arc, Olivia de Haviland in The Snake Pit, Barbara Stanwyck in Sorry Wrong Number, and eventual winner, Jane Wyman in Johnny Belinda. Dunne would end her career without that coveted Oscar, but she left us with an extraordinary film legacy as a testament to her unique talents.